Walter Ritte led about 60 demonstrators at the state Capitol yesterday to urge a hearing for a bill calling for a halt on research for genetically modified taro. They cornered state Rep. Clifton Tsuji in his office until House Speaker Calvin Say, left, arrived to dissipate the crowd. Farmers, students and native Hawaiian activists protested yesterday at the state Capitol to urge lawmakers to hold a hearing on a Senate bill that would ban research and cultivation of genetically engineered taro. But House Speaker Calvin Say and Rep. Clifton Tsuji, chairman of the House Agriculture Committee, said the bill is a complex issue and that more time is needed. 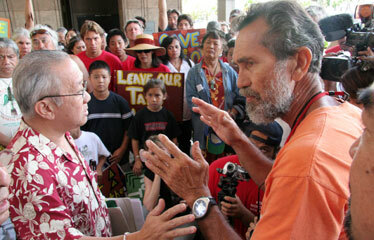 In a heated discussion in the Capitol courtyard, activist Walter Ritte of Molokai yelled to Say and Tsuji, "This is not about research. This is about changing the genes of our ancestors. That's what it is about." Because a hearing was not held on Senate Bill 958, SD 1, HD 1, it is likely dead this session in spite of the protest. The bill called for a 10-year moratorium on testing, cultivating and growing genetically engineered taro. This is the second year the bill was introduced without success, activists said. Scientists at the University of Hawaii fought the bill because they want freedom to genetically modify taro to protect it from diseases that could threaten to wipe out the islands' crops. About 50 protesters surrounded the offices of key lawmakers, chanted, "Hear the bill!" and waved signs with slogans like "Leave our taro alone" and "Just say no to GMO." 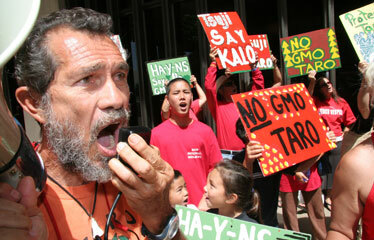 Walter Ritte and about 60 demonstrators gathered yesterday at the state Capitol to demand a hearing for a Senate bill calling for a halt to research and cultivation of genetically modified taro. In a written statement, Ritte said, "The Hawaiians have not given their permission for scientist to modify the genes of their first-born Haloa, the taro." Jerry Konanui, a fifth-generation taro farmer in Puna who flew to Oahu from the Big Island, said, "As a Hawaiian, it is culturally offensive for them to come and genetically engineer taro." Tsuji said, "On one side we talk about scientific and research; culture and history on the other side. On both sides they're polarized with issues. We hope this polarization can come to one core issue and come together and work together." He added that he was hopeful all sides could work together on a bill that could be introduced next session. Kevin Kelly, UH system managing director of the Experimental Program to Stimulate Competitive Research-Hawaii, said, "The university's position is that this bill puts restrictions on research." The genetically modified species of taro are Chinese, not Hawaiian, and they have only been tested in laboratories so far, he said. "There is a significant disease moving in the south of Pacific that has already wiped out taro production in some of the islands," said Stephanie Whalen, president and director of the Hawaii Agriculture Research Center. "Research has to be looking at down the road, how can we sustain this," she added. "Research has to be forward-looking." Last year, the University of Hawaii relinquished three patents on taro breeds that were crossbred for disease resistance after months of protests, including a demonstration in which farmers and students chained the entrance of a school building before a meeting of the Board of Regents.